I’m going to share you with you something unexpected. A gold lipstick. Well not so much just a gold lipstick, but a gold lipstick that I like, and which I think amps up the Holiday/Glam factor. I present you the Dior Or Etoile Rouge Dior lip colour. Dior’s Christmas collection has gold infused throughout their whole collection. I have Nocturne to show you too. A gorgeous deep red shot through with gold. But today, its the star colour – Or Etoile. The day I got it, I thought “Huh? How on earth do I wear this one?” and I was stumped. Or Etoile is a straight gold lipstick. I wouldn’t use it on its own to be honest. I’ll show you why below – I look like a Golden Corpse! But it is beautiful dabbed over an existing lip colour. Here is PB the Golden Corpse. This is Or Etoile straight on the lips. There might be people who can pull off a colour like this one, but I’m not her. On the lips it is just gold shimmer. It is testament to its pigment that you even see my lips as being gold at all. 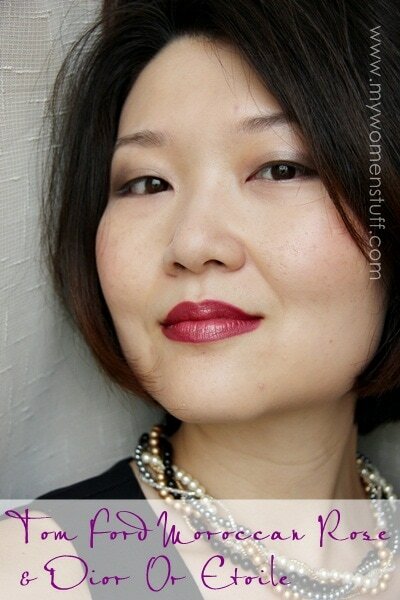 It is a semi pigmented lip colour like all Rouge Dior and feels light on the lips. Here’s a swatch on the back of my hand – again, straight gold. Very pretty actually, don’t you think? How I use Or Etoile is for emphasis. I dab it on top of an existing lip colour, in the middle of my lower lip and upper lip. 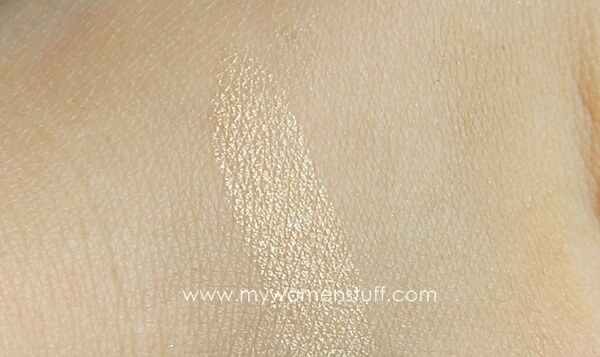 This adds gold shimmer, highlight and plumps up the lips. There is a problem of course. Dabbing the lipstick directly over an existing lip colour means you mess up your lipstick something awful so I do spend time cleaning off lip colour from Or Etoile after every use. For some reason, this also means the lipstick wears out more quickly. I’m already smudging off the word Dior that is etched into the side of the lippie, and I almost never reach that bit this quickly! 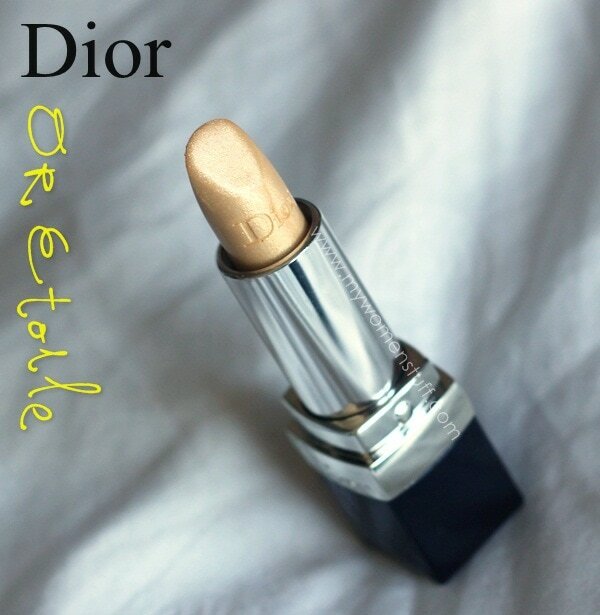 A novelty lip colour that has the same high quality associated with Rouge Dior lipsticks. It is very smooth and not gritty but is mainly meant for highlighting existing lip shades. 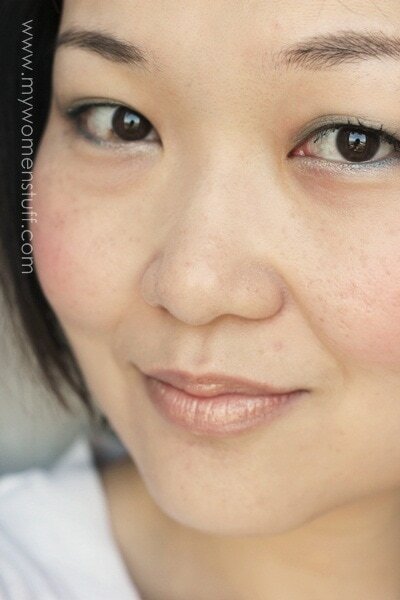 It works best over a deeper lip shade and adds a golden warmth, highlight and an illusion of plumped up lips. Not a must have, but is fun to own. I can imagine that Or Etoile can also be used as a highlight for eyes maybe, if one were so inclined. Just a touch of creamy gold colour where you need it. Its rather surprising, but I have been using this quite a lot, initially for fun, but later just to see how interesting it can make my lip colours look. It lightens the lip colour somewhat, which you may notice from the Tom Ford Moroccan Rouge if you compare it to my earlier swatch – Moroccan Rouge has no golden shimmer. Rouge Dior Or Etoile Lip Colour retails at RM95 at Dior Counters and is Limited Edition for Christmas and Holiday 2011. I’ve tried a golden lippie before and ended up pale as a corpse! But the result is beautiful over another lipstick. Lightens up the mood, I’d say. But TF’s Moroccan Rouge doesn’t really have much room for improvement, does it? It is perfect in itself! Hi Mari! No you’re right. Tom Ford needs no improvement but the gold adds a zing to the color and turns its straight into holiday mode! How have you been anyway? Hope alls been well! wow this is gorg! do you know of any good dupes for it? Unfortunately no I don’t know of any dupes. Some people have commented about a similar one in Benefit but I don’t know if it’s still around. I’d totally wear it alone and in the center of the lip for a highlighter. Loving it!